A wine that is named after the oak forests which surround Emiliana's magical and spiritual Colchagua home, Los Robles. 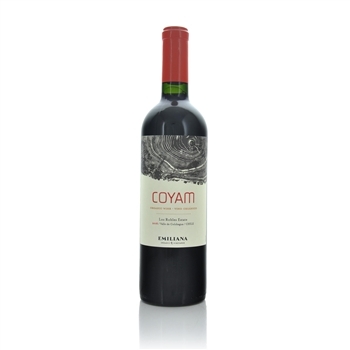 Coyam is the ultimate expression of this estate and is a field blend of their best grapes. 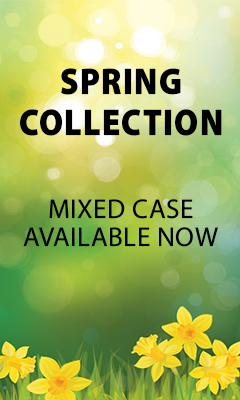 The soil contains a mixture of clay and sand, with the depth of the soils 2 - 3 meters, optimal for red varieties. The summer was dry. The bountiful rainfall allowed us to begin irrigating late in the season. Veraison and ripening were delayed by 10 days. The harvest began in the last week of March.The wine is made from a blend of Syrah (45%), Carmenère (35%), Cabernet Sauvignon (8%), Mourvèdre (%), Malbec (4%) and Petit Verdot (3%). The first stage, reception, began with a selection on a conveyor belt to remove any leaves and damaged bunches, etc. The selected bunches were destemmed, and the individual berries were selected by size via a vibrating table for better precision. The grapes were then gently dropped into stainless steel tanks for fermentation with native yeasts at 24º–26ºC with a program of pumpovers determined by enological criteria. The new wine then remained on its skins for a 5-day post-fermentation maceration at 22º–24ºC, for a total maceration time of 20–25 days. Malolactic fermentation occurred naturally in oak barrels. The wine was aged for 13 months, during which time it stabilized naturally without any treatments. It was later lightly filtered using a 3–5-micron (absolute) cartridge filter just prior to bottling. Emiliana's iconic blend. Violet red in colour. This is an elegant and complex perfumed wine with fruity notes of cherries, plums, blueberries, and blackberries, along with refreshing notes of mint and a hint of black pepper, leather, and pencil lead. The palate is also very fruity with fresh acidity, good concentration, and good structure that draws out the lingering finish. This is a complex wine that needs intense preparations such as grilled red meats, including wagyu, beef, or lamb, served with potatoes au gratin, rice, or spicy sauces. Decant before drinking and serve in Bordeaux-style glasses at 18ºC. "The ripe and heady 2015 Coyam feels balanced within its XL style, powerful yet harmonious, with elegance, concentration and balsamic, herbal and spicy flavors. No less than 166,656 bottles produced." Emiliana is one of the largest organic producers on earth. They have started producing some bottle-refermented sparkling wines and also a Vigno, which, according to VIGNO (Vignadores de Carignan) rules, must contain at least 65% old-vine Carignan from dry-farmed vineyards located in the Maule region.